We left city life in Bangkok for the calmer and more rural city of Chaing Mai in Northern Thailand. Each part of Thailand is so different that the areas feel more like their own country. Chiang Mai is the portal to the "hilltribe villages," including the Kayan village of women with long necks. But, there were also quite a few things that make Chiang Mai stand out in its own right, such as the beautiful countryside, home to many elephants. Or the temple on top of the mountain at Wat Prathat Doi Suthep, previous home to the Emerald Buddha that is now in the Grand Palace in Bangkok. We had the once-in-a-lifetime experience of riding, bathing, and "swimming" with elephants. But before I get to our visit to the Happy Elephant Home, booked through Woody's Elephants (at the recommendation of our Homestay), I want to talk a little about an important part of Thai culture--etiquette. The Thai Smile. You will undoubtedly see many smiles, but they are not to be trusted. 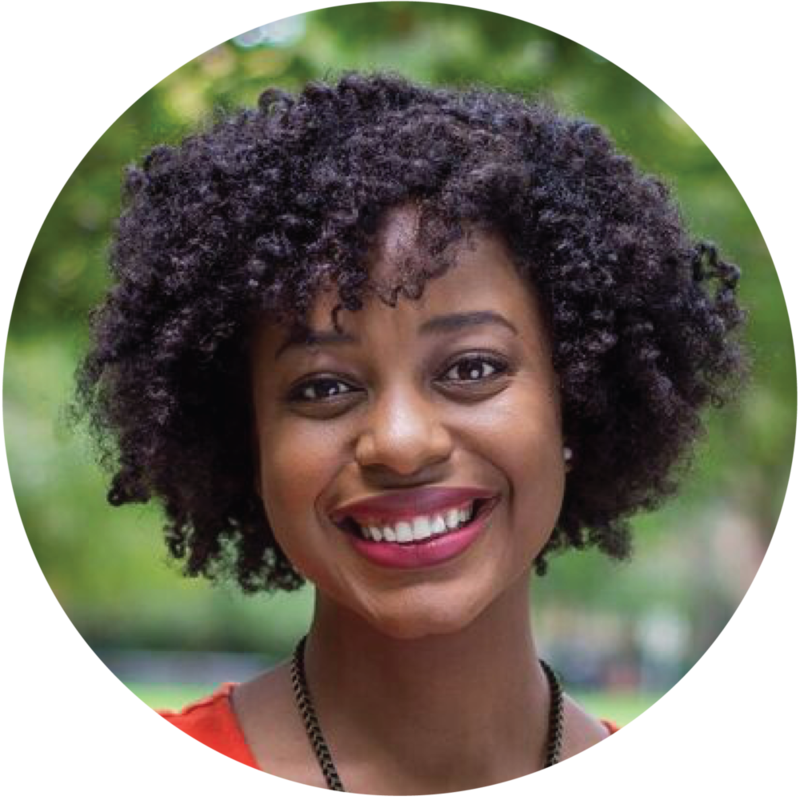 It is simply polite to smile, regardless of how you are really feeling. It is also polite to say "yes," even when the answer is really "maybe." It is up to the other person to use context clues. The Wai. The wai is the Thai greeting that involves a slight bow, and the palms brought together in prayer. It is done as a sign of respect, so customarily, one does not bow to someone who is younger. The deeper the bow, the more respect someone is offering. Feet. Be careful where you point them. Not only is it proper etiquette to be barefoot in most places (temples, homes, salons), but it is equally important to be careful where you point your feet and where you step. You should not point at people or things, and you should not even point your feet in the direction of others. This is also true for temples, and as you can see in the photo, everyone is sitting in such a manner that their feet are not pointing in the direction of Buddha. It is equally important to not step over people or their belongings. Dressing respectfully at temples. This is very important for any visitor to remember. Ladies must cover their shoulders and wear long skirts or pants. I brought a scarf to drape over my shoulders which was sufficient for everywhere except the Temple of the Emerald Buddha, where I was forced to put on "borrowed clothes." If you look closely, you'll see me wearing strange pieces that don't match. Don't touch the monks. Monks are everywhere, but women should be especially careful to not touch the male monks, even accidentally, as they would have to go through a very thorough cleansing process if you even unintentionally brushed against one. I chatted with a "novice"--a 17-year-old monk-in-training. I gave the official Thai greeting, the Wai, as a sign of respect. These gentle giants are an integral part of the history and culture of Thailand. Once used for battle and farming, they remain revered and respected. The elephant-human partnership involves a mahout, someone who is trained to care for it. 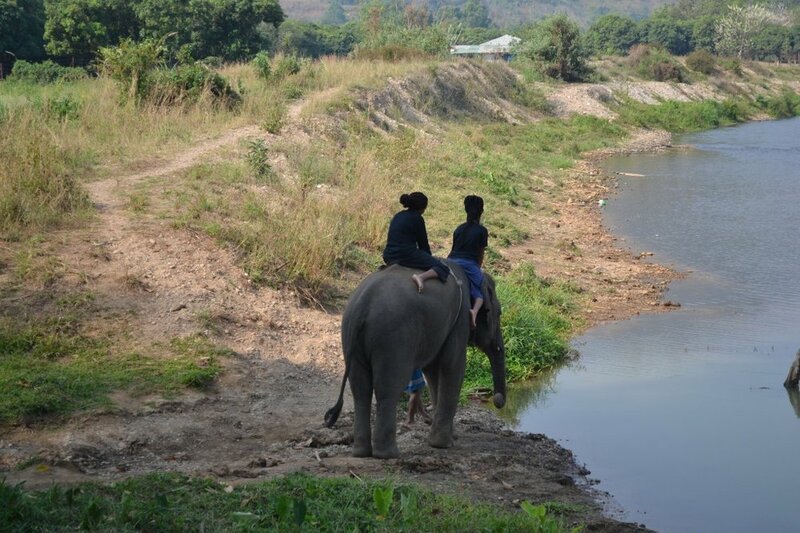 In the pictures below, you will see each elephant's mahout walking with it and steering us when we were in the river. We drove quite far to reach the Happy Elephant Home--over an hour outside of Chaing Mai. But the scenery was well worth it, and it's obvious that such giant animals need a lot of space to roam. Our elephants were treated humanely. You could only ride them once they reached a certain age, they had days off, and they only worked a limited number of hours per day. In fact, each elephant gets an annual two-month vacation. Plus, our mahout was constantly checking on us to make sure that we were sitting in a position that was the most comfortable for our elephant. 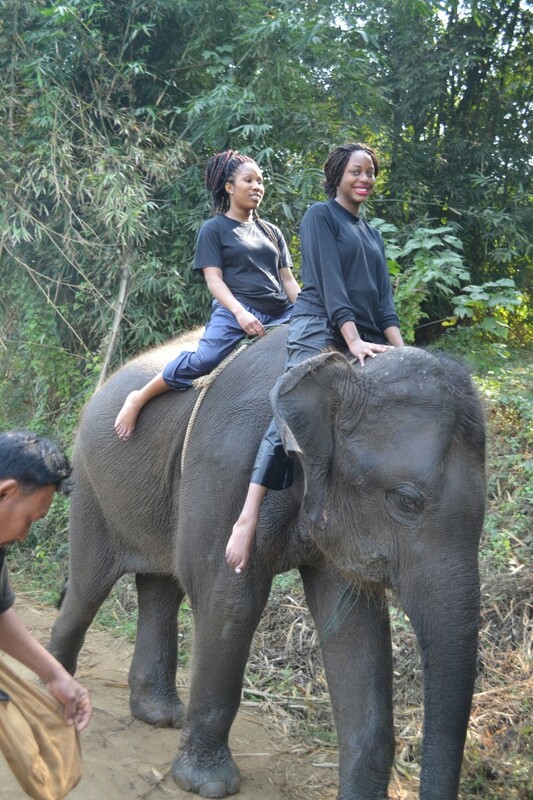 My most vivid memory from this experience was also the most traumatizing--nearly falling off of the elephant on our initial trek down a very steep hill. We didn't have helmets, so falling off was not an option. It took every muscle in my core and inner thighs to stay on top of the elephant. My inner thighs were sore for a week. After trekking down a steep hill, we ended in a little watering hole where the elephants then just sunk down, and we slid right off. We then "bathed" the elephants by massaging them with water from the watering hole. The elephants seemed to be having a great time, and they'd spray us with their trunks. After we were completely soaked, we then hopped back on the elephants and went to a deeper river where the elephants waded through. 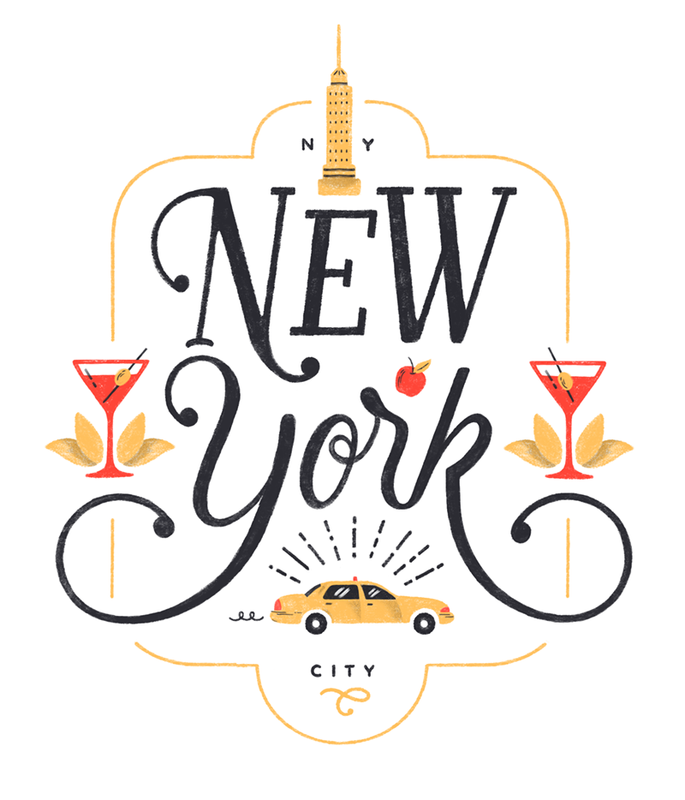 It was truly an incredible experience, and some things, you have to do when you're young. If I were even slightly less in shape, I can't imagine I would have survived during our initial trek down the steep hill. If you are going to spend time with elephants in Thailand, please be careful and research the place to ensure that you are contributing to conservation efforts--not destructive exploitation. It is far easier to find a great elephant sanctuary in a rural place like Chiang Mai than a beach area like Phuket. While in Phuket, I witnessed heartbreaking atrocities where elephants were chained to poles in urban areas. At the end of our steep trek downhill. 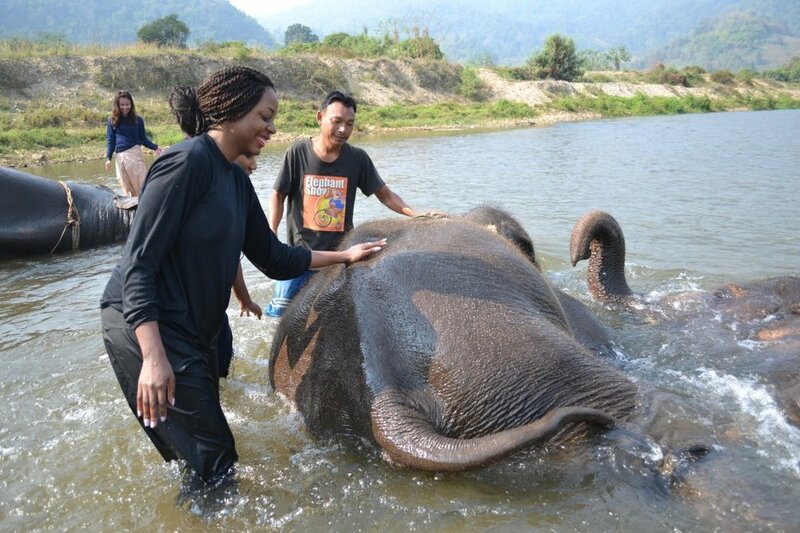 "Swimming" with elephants--there is a look of complete fear on my face!